Oil workers are trying unsuccessfully to extend a road to an oil field through a sacred lichen grove on Khanty ancestral lands 180km from Nizhnevartovsk in Khanty-Mansi Autonomous Okrug, Russia. 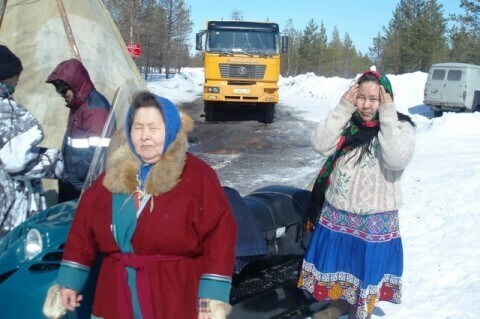 On April 28, Representatives of the Khanty community of Nizhnevartovsk district blocked operations of the “Varyoganneft” oil company which is building a road through a sacred lichen grove to an oil deposit on the Khanty’s ancestral lands. Local residents erected a Chum (a Siberian nomad tent) to block passage of the company’s equipment and are not planning to remove it until the oil workers leave. According to community representative Alexander Aipin, the Agan lichen grove is a sanctuary and a place where the Khanty have worshiped the patroness of the Agan river for many centuries. The community’s lawyer, Galina Obolenskaya, who is also a member of the city council of Raduzhny, says that the representatives of the company are unable to produce the necessary permits for the operation, therefore, their actions are unlawful: “The oil company has neither the legal nor the moral right to work on these lands. These are territories of traditional nature use. Indigenous peoples assert their right to live on their traditional lands where their ancestors lived”. Moreover, according to Obolenskaya, Varyoganneft and other oil companies intend to dispose of waste in a tailings pond that’s located in the immediate vicinity of the Khanty’s ancestral lands, threatening mass contamination of the territory. In addition, bulldozers have already removed the lichen layer, which is the main food source for local reindeer. The recovery of lichen takes decades. Since the beginning of the year, oil spills have also occurred near the protected area. After the action by community members, representatives of the oil company came to the site for talks. However, when no compromise could be reached, oil workers attempted to file a complaint with the police alleging that the actions of the local residents are causing the company to suffer losses. After reviewing the situation, the police decided that there were no grounds for filing a civil complaint. The company refused to give any comments, noting that this case is being dealt with in court. Meanwhile, Khanty from the indigenous village of Varyogan established a civil organization “Khranitely” (“The Keepers”) to defend their rights, lands and interests in disputes with local extractive companies. Conflict between oil companies and the residents of the ancestral lands began late last year, following the 2012 sale of the Martillovskoye field on Khanty land. This year, oil workers started to extract oil from the deposit, prompting construction of a road through the lichen grove and the ancestral land. Article first published at IWGIA.org. Edited and re-published with permission.